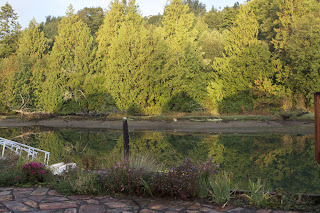 Early morning light from the deck. We have been so fortunate to have this lovely weather even though, when I stepped outside, I nearly froze! The trees are just starting to turn, lots of golds and yellows and the reflections are gorgeous. The garden is looking pretty tatty now; been removing dead stuff so there isn't much color left, though around the side of the house, because of the warm weather we've been having, the poppies are blooming again! "They" are telling us it will be an El Nino year which for us means drier and warmer - anything has to be better than last year. I was so convinced I wouldn't be here this winter, that I got rid of almost all my winter clothes so now I have to replace them. But they were all too big for me anyway, so regardless, I would have had to do this. Should be fun, though I am definitely not much of a shopper. The community here had a get together down at the marina pavilion yesterday evening, to celebrate the dredging that is finally happening. I think they have finally decided to hire someone on an ongoing basis to work with all the government entities involved so that we can maintain a permit to keep the marina and entrance clear - talk about bureaucracy - I have lost count of how many government bodies are involved and have to have their say. Anyway, it was an effort to go down there, but I have to force myself to do those sort of things. It is just that I don't have much in common with them all - they are all couples, well most are and very clique-ish. But there is a single lady down the street who wants to walk every day so we are going to try to get some sort of schedule going, which will be good. I should be out there now, instead of sitting here in a nice warm house writing this.